While the name may be a little odd, I have found that grilling your chicken in this manner is extremely simple and produces amazing results. So amazing, in fact, that it doesn't seem right to be so darn simple! 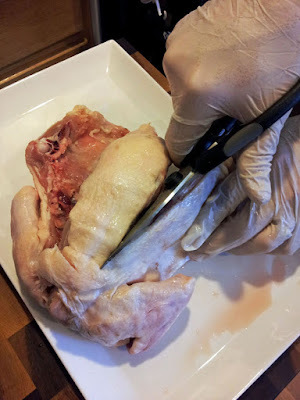 The main idea of spatchcock chicken is that we will cut out the spine and flatten the bird in order to cook the entire bird more evenly. 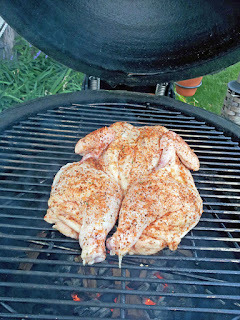 This allows the thighs and legs to cook up to a higher temp while cooking the breast meat to a slightly lower temp. The ribs also protect the breast meat somewhat from the heat to ensure juicyness. First step is to rinse the chicken and pat dry. Some have had good results with crispy skin by leaving it uncovered in the refrigerator overnight. Even if you don't have time for this step, your chicken will turn out just fine. 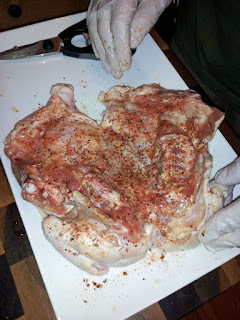 Lay the chicken breast down on a cutting board. Begin by cutting either from the neck or rear on one side of the spine. 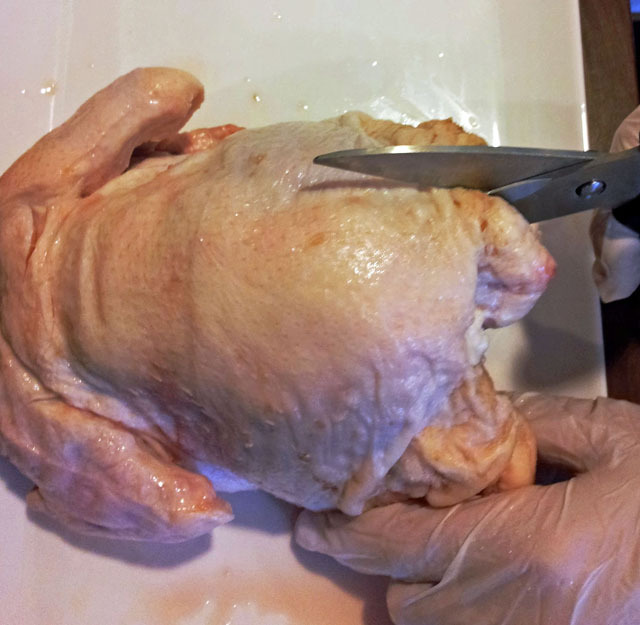 Once through, go back and fully remove the spine with the second cut and discard. Or save to make some chicken stock if you feel ambitious! Now that the spine is removed, flip the bird over. Grab it with both hands and flatten out the bird. Now we can throw a bit of seasoning on the bird. Normally I rub some olive oil first and then shake on a little rub. I encourage some experimentation here. 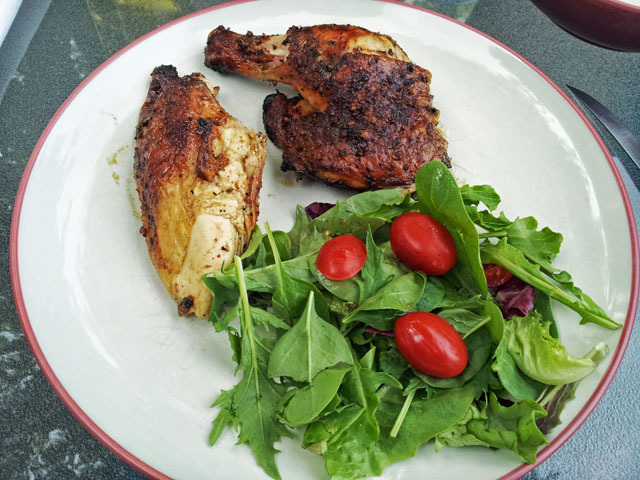 You can try a basic chicken rub or you would be surprised how good a chicken can taste with simply salt and pepper. Time to get the grill ready. We will be doing a direct cook on a raised grill. 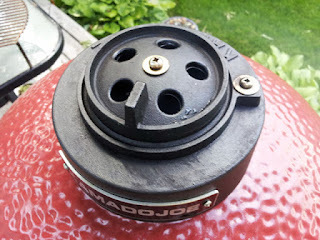 For the Kamado Joe, I raise the grill to the height of the edge by using the heat deflector frame, without using the actual heat deflector. This will keep the grill about 9" off the top of the coals and will keep the flare ups down while still allowing this faster, direct cook. 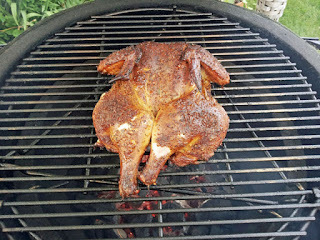 Once the temp gets up to 400 degrees I normally throw in a couple wood chips onto coals, wait a minute, and then throw on the bird. All we need to do now is monitor the temp. There is no flipping over, the bird stays in this position for the entire cook. Keep the temperature at 400 degrees by adjusting your vents. What works for me is to keep the bottom vent fully open and close the top vent but keep the daisy wheel fully open. You may need to start with the vent half closed and then as the grill stabilizes close the vent and keep the daisy wheels open. Please check out my post for managing vents. The chicken should take approx 30-50 minutes to cook. I normally check the chicken after about 30-35 minutes. There are many variables that will go into the cook time so you will really need to cook to temperature rather than cooking to a specific time. After 35 minutes at 400 degrees, we are usually in the ballpark and can get a pretty good estimate on how much longer we need. 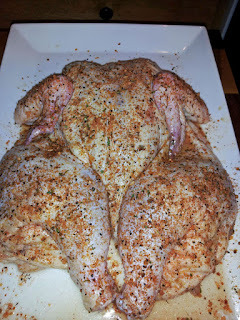 I generally cook the thighs and legs to 170 and the breasts to 155. 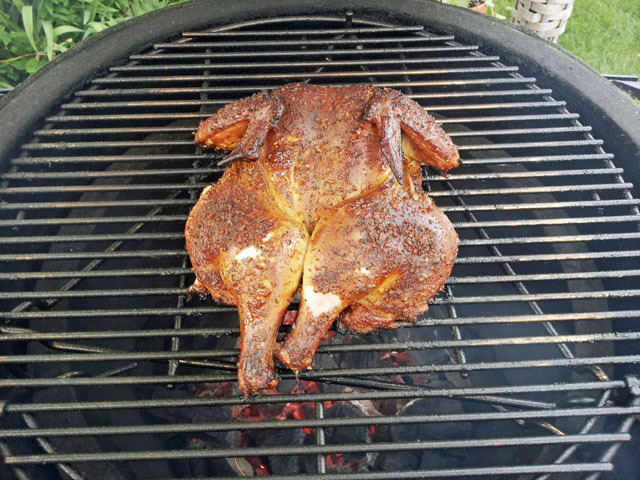 After you pull the chicken and let it rest for 5-10 minutes prior to carving the temp will continue to go up another 10-20 degrees. 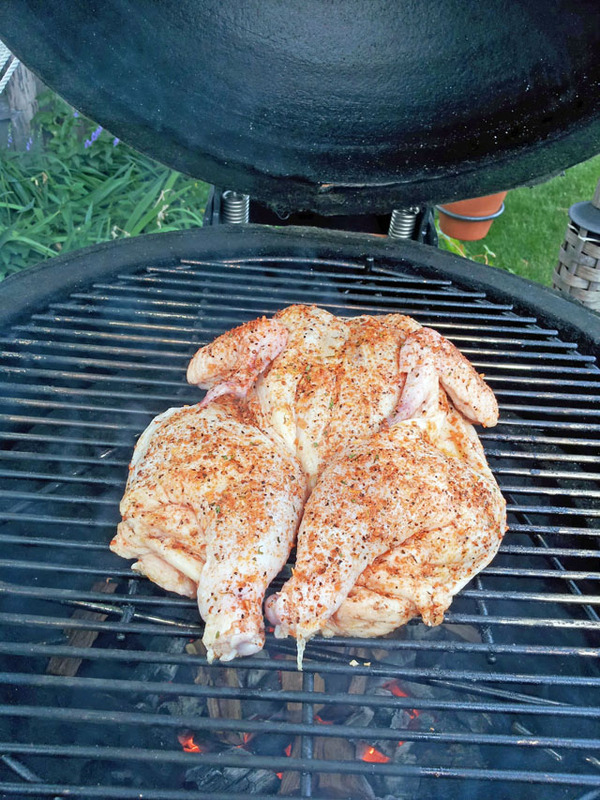 Also, note that the thighs and legs are much more forgiving for going over in temp than the breast meat. Here is the finished bird. After you've done this a few times it will start to be your go to method when you want something quick, simple and delicious. 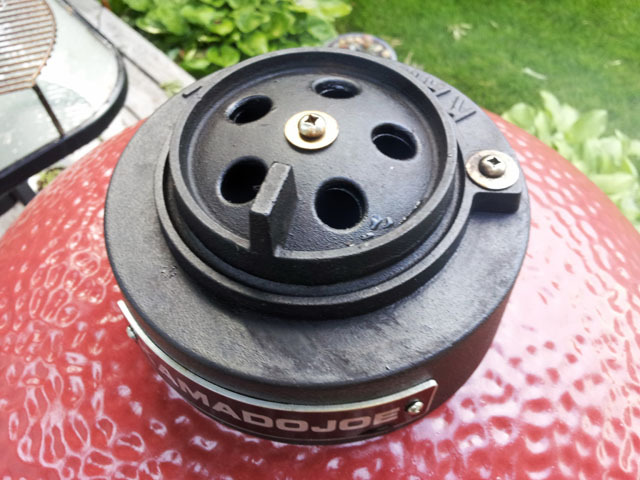 What's your favorite Kamado grill?